First, the snow never wanted to leave. 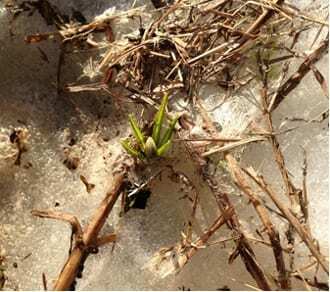 In central Massachusetts, snow was still on the ground in mid-April as bulbs and perennials pushed their way out of the half-frozen ground. Then, from April into May it was unusually dry, no April showers at all but plenty of May flowers. All the moisture from the late snow cover did contribute to a spectacular blooming season for spring blooming plants and trees. Crocus broke through the snow and ice on April 9, 2013. The April showers came later, when torrential downpours from late May into June filled rain barrels and caused yet more flooding in the hilly regions of New England. In the past few years, it seems that a 2” – 4” rainfall in just a few hours has become a normal weather pattern. The need for well-managed stormwater runoff and erosion control is becoming an increasingly essential service provided by the landscaping business in a post-Irene/Sandy northeast. Moisture from late snow led to a spectacular spring bloom. The dog days of August came unexpectedly early with stifling heat and humidity in…June?! During what is usually the best time of year to be outdoors in New England, all outdoor activities and garden work had to be put on hold, and we all lamented that it would be a terrible summer. A sopping wet July (not sure if I recall a mud season in July before?) did make it possible to install new gardens well into July, although fungal spores and weeds also exploded from all the moisture. I had many anxious clients contact me about fungal damage to plants and the mushrooms growing in their lawns. Then, as if by magic and in an attempt to make up for the June weather we never had, the weather became warm, sunny, and dry in August and September. The rest of the season was a delight, both for outdoor activities and for gardening work. Irrigation was the main focus due to the lack of rainfall – for vegetable beds, containers and newly-planted plants and trees. Fall was fairly seasonal, although we saw no killing frost until late October in our low, cold river valley in Spencer. We picked tomatoes and peppers until almost Halloween, and I saw hay being cut in November. It was definitely an extended growing season for farmers after a late start. Tallamy makes the connection that locally native plants support many more of the co-evolved insects that wild birds need in large quantities to feed their nestlings. In an area planted with regionally native shrubs and trees, you will likely see a much wider range of wild birds than the small number of bird species that visit bird feeders. Photo copyright Pat D. Hemlepp. Photo used by permission. Less lawn, more plants, but NOT the typical “Landscapers’ Special” of Yew, Boxwood, hybrid Rhododendron, Azalea, Barberry, Bartlett Pear and Miscanthus Grass that graces the front yards of (seemingly) every house built on the North American continent since 1945. Encouragingly, more people are beginning to understand the vital connections between native plants and birds, pollinators and other beneficial forms of wildlife, and are looking to incorporate more natives into their landscaping. I have Doug Tallamy‘s book Bringing Nature Home to thank for a number of new and repeat clients who have seen/heard him speak, were influenced by his very illuminating book, and now want to plant natives to attract herbivorous insects and birds. They are enthusiastic, but need help finding the right plants for their own individual site conditions. The difficulty sourcing some of the more unusual but garden-worthy native plants can be a limiting factor for native plant landscapers; many of the less well-known natives are just not available in the nursery trade, although that’s slowly improving. In Massachusetts two non-profits, New England Wild Flower Society in Framingham, MA, and Project Native in Housatonic, MA, continue to expand their nursery offerings, and I source many of my “staple” native plants from Bigelow Nurseries, a large wholesale and retail nursery in Northborough, MA. Bigelow’s plants are locally grown within the state, and their family-run business employs a large number workers in the MA horticulture industry. In desperation, however, I’ve been learning plenty about propagating some of the more difficult to source native plants from my own farm, in order to use them in design projects. The beautiful New England aster (left) is readily available in most nurseries, but try finding the native bunchberry (right) for sale anywhere! With its tiny dogwood-like blooms and spreading habit, bunchberry deserves more use as a groundcover for damp shade in New England. 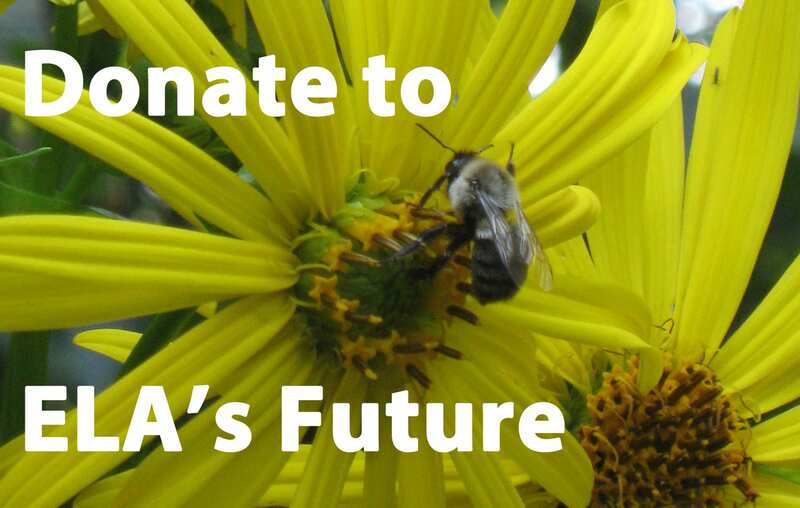 The good news is that New England’s native plant availability should drastically improve in coming years due to a joint project by the New England Wild Flower Society and Project Native. Well underway, this project aims at large-scale propagation of native New England plants intended to supply nurseries with inventory to meet increased demand. There’s growing demand for landscapers to perform small- and large-scale invasive plant removal with minimal or no use of herbicide and with no destruction of soil life and structure. Hands-on methods of weed control include clove/vinegar treatment, flaming, repeated cutting/mowing, the “smother” method, and manual removal with Weed Wrench™. 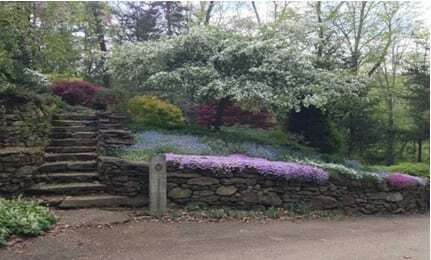 The client of this property plans to hire a local landscaper to safely remove the English ivy, bittersweet and vinca in order to save the struggling trees and allow her foamflower, anemone, actaea, ferns and other natives she planted to spread into the woodland garden. I have done an increasing number of consults, especially in MetroWest (western Boston suburbs), for clients who bought properties taken over by aggressive plants. 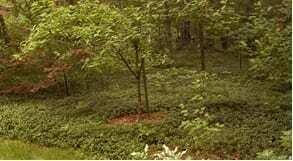 Whole areas of their yards are covered with thick mats of aggressive non-natives such as vinca, Japanese pachysandra, bishop’s weed and English ivy. 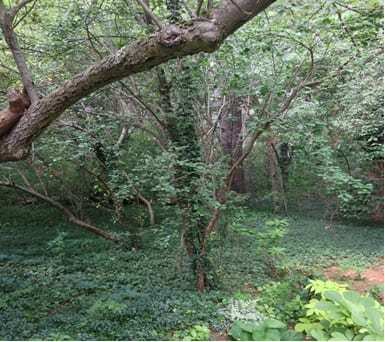 One homeowner contacted me because vinca and English ivy (planted in one spot near the house 30-40 years ago) had taken over the entire wooded area of her property, and she could not get anything else to grow there (at right). As the trees are an important summer buffer to her surrounding neighbors, she was justifiably concerned about the invasive vines slowly killing her trees. Another property owner contacted me about adding bird-friendly plants to a Concord property, which had once been lovingly gardened by previous owners but allowed to just “be” for the past decade or so. When I saw that just about every inch of a full acre of wooded property was blanketed in the usual suspects (vinca, pachy, bittersweet and lily of the valley), I had “The Talk” with them about removing the invasives and replacing with site-suited native plants to restore diversity to their site. The clients have dogs and did not want Roundup™ (glyphosate) herbicide to be used for the removal, and the very steep slope on which the house was perched precluded the use of heavy machinery. So removal will be done carefully over time, by hand, and replacement plants carefully chosen to shore up the slope during and after the transition. Labor-intensive work, but the only solution for these clients. You can’t really appreciate why it’s a bad idea to grow vinca (above), Japanese pachysandra, lily of the valley, or English ivy until you are faced with an area where one of these plants has been allowed to spread uncontrollably. 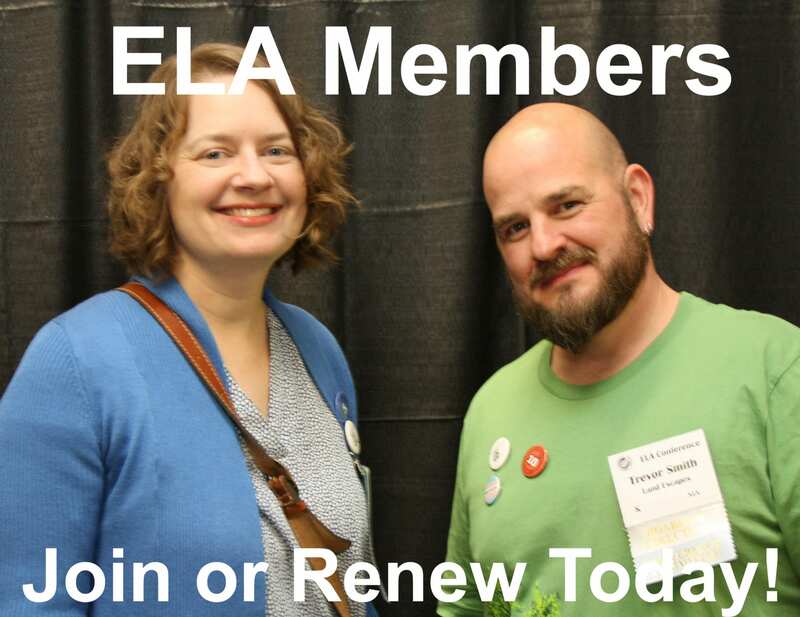 We are all beginning to pay the price of the ecologically short-sighted landscaping conventions of the past century, and locally-trained native plant gardeners/landscapers are uniquely positioned to help support and guide the transition to greener “eco-landscaping” by homeowners and the landscaping industry itself. In my garden coaching work and in my talks to garden clubs, I try to preach the message “Gardeners, Just Say No” to the conventional exotic “hardy shade” plants such as the vinca, pachysandra, bishop’s goutweed and English ivy. They are found at every garden club sale and plant swap, but these once seemingly innocuous groundcovers are now spreading from gardens into natural areas across the state, blocking the essential interactions between native plants and their co-adapted wildlife. Garden clubs tend to be concerned with the aesthetics of gardening, but some people are listening. Until recently, not many people considered their home landscapes to be in any way connected to the natural world, but then people begin to notice that the only plants (and birds!) they see in their backyards are just a few aggressive non-native species. And when they realize these same species are found in everybody else’s yard too, some are willing to take up the challenge of halting the spread of invasives and encouraging biodiversity back into the landscape. Several of my projects this year were interesting case studies for integrating native plants into challenging sites. Two in particular stand out. 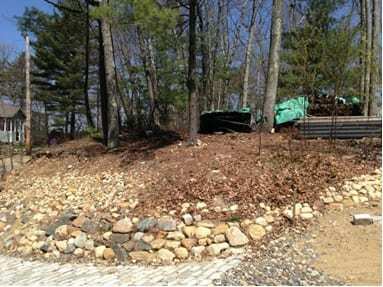 This steep sandy slope needed erosion control – ASAP!! Project 1 was for clients who built a small, zero-energy, solar home on a steeply-sloped, glacial sand deposit directly above a seasonal/vernal pool and now sought landscaping ideas that would not need chemical fertilizers, pesticides, or irrigation. They did not want any lawn to mow, and they wanted to restore the site for wildlife, especially birds. The clients are gardening newbies but wished to do the landscaping work themselves. Challenge? What challenge: this project is a garden coach’s dream!! We added plants native to eastern coastal sandy/well-drained soils, including wild blue lupine (Lupinus perennis) , New Jersey tea/redroot (Ceanothus americanus), hyssop-leaved thoroughwort (Eupatorium hyssopifolium), tickseed (Coreopsis), bearberry (Arctostaphylos uva-ursi), bayberry (Myrica pensylvanica), summersweet (Clethra alnifolia), blue and yellow indigo (Baptisia australis and B. tinctoria), moss phlox (Phlox subulata), Hubricht’s Bluestar (Amsonia hubrichtii), red columbine (Aquilegia canadensis), along with a large swath of ‘Low Grow’ fragrant sumac (Rhus aromatica) to stabilize the steep “cut” made to form the driveway. Hyssop-leaved thoroughwort is a Eupatorium of sandy soils and a good companion for rudbeckia, grasses, tickseed and other meadow plants. The client learned how to dig and plant her rocky soil, and I instructed her to water her new plants on a schedule for the rest of this season. I did have to reassure her that after this first summer, these plants should never need to be watered again. Most plants have thrived so far. 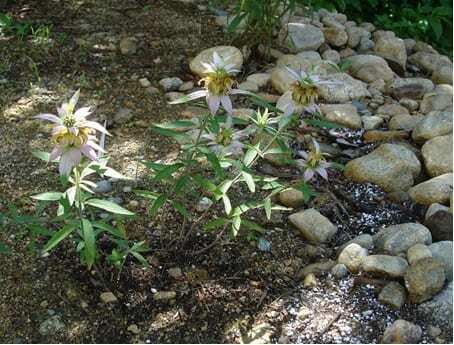 The new horsemint (Monarda punctata), also known as spotted bee-balm, bloomed nicely its first fall. This relative of wild bee-balm (Monarda fistulosa) really thrives in the moist soil with sharp drainage near the house. Horsemint’s interesting stacked flowers in the fall are very popular with fuzzy and docile bumble bees, who drink sugary nectar from the flowers. 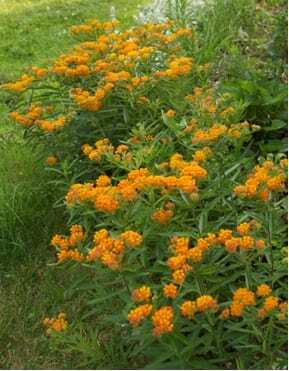 Butterfly weed is a beautiful native New England plant that blooms in early summer in any well-drained soil in full sun. The client was thrilled to discover a self-seeded butterfly milkweed (Asclepias tuberosa), and she is now propagating milkweed from seed in other places on the property. She was amazed that a plant that blooms so beautifully would grow on its own in her “crummy” soil (her quote!). Sweet fern (Comptonia peregrina), wintergreen (Gaultheria procumbens) and lowbush blueberry (Vaccinium angustifolium) were also identified and encouraged in several places. Black cherry (Prunus serotina) saplings were thinned out, but a few were left standing for erosion control and wildlife habitat (nectar, fruits, foliage). We also found moss, native sedge (Carex pensylvanica) and violets (Viola spp. ), which the client has learned to weed out of beds but encourage in other areas to form a green flowering no-mow “lawn” and pathways in soil where a traditional lawn would be all but impossible. My client planted colorful annuals along the edges of planting beds this year, and plans to use a few annuals next year, too. But instead of buying annual mums to plant in the fall, she watched for wild asters to make an appearance on their own; and sure enough, they came. 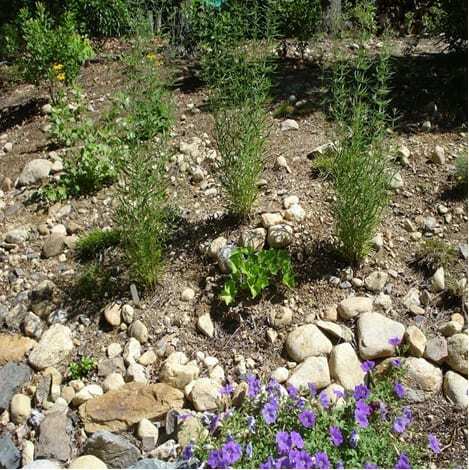 I received an excited email photo in August about a lovely violet aster that managed to grow and bloom in a crack in the driveway rock riprap. The next few years should be a delight for this new gardener as she learns about local plant communities and their connected wildlife, while watching as the ecosystems of their neighborhood knit back together into a working whole. The dog’s-eye view of the parking lot will soon be screened by new plants. Project 2 was for a Boston client with an elevated courtyard garden. 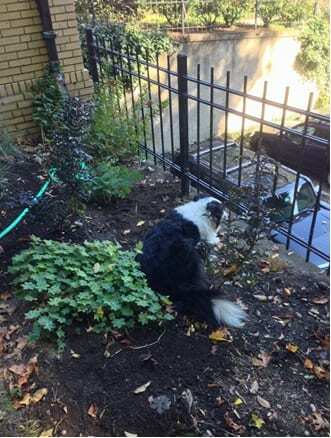 The client was looking for privacy screening, a beautiful garden sanctuary, and urban wildlife habitat, but the space also accommodates a big and boisterous dog. We removed some oversized rhododendrons, along with the existing daylilies and other perennials which were (in the client’s words) ‘boring’. Then, we added dwarf cultivars of native shrubs including two ‘Black Tower‘ elderberry (Sambucus racemosa), a ‘Blue Jay‘ dwarf white pine (Pinus strobus) and a dwarf witch-alder (Fothergilla gardenii), plus an anchoring serviceberry (Amelanchier) in a staggered pattern along the open, exposed fenceline. 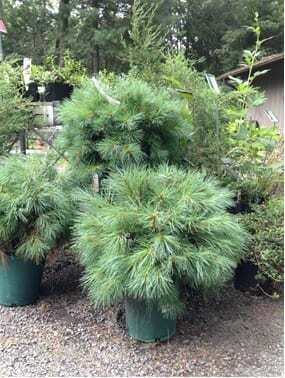 New England Wild Flower Society’s nursery at Garden in the Woods in Framingham, MA, carried this dwarf selection of White Pine this year – just perfect for spaces too small for a full-sized tree. Virginia creeper (Parthenocissus quinquefolia) will cover an ugly cement retaining wall, and the native clematis vine virgin’s-bower (Clematis virginiana) billowing over the fence in summertime will provide extra privacy as well as bird and pollinator food and habitat. In a hot, sunny corner, we added a mini-meadow containing colorful prairie plants and low grasses with strong, deep roots that can withstand the occasional doggie grab or galumph. An open area of lawn grass mixed with clover was left open for doggie romping and rolling. In summertime shade, foamflower (Tiarella cordifolia), Virginia bluebells (Mertensia virginica), wild ginger (Asarum candadense), wild geranium (Geranium maculatum), solomon’s seal (Polyhonatum), trout lily (Erythronium americanum), blue phlox (Phlox), cardinal flower (Lobelia cardinalis) , black cohosh (Cimicifuga racemosa), moss and ferns will add color and interest from earliest spring right through the year. The client has reported back that she has indeed watered as instructed, and is enjoying getting to know her new and unusual plants which are filling in nicely. Her dog is also delighted with all the additional time spent outdoors with his favorite person. We are all looking forward to seeing her urban native plant garden come alive with flying and feathered friends in the next few years. Ellen Sousa’s Turkey Hill Brook Farm website and blog has information about New England habitat gardening, including sources for native plants in southern New England. 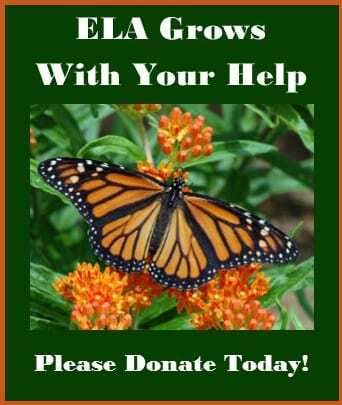 Native Plants and Wildlife Gardens – online site featuring information, articles, opinions and resources about all things native plants and wildlife gardening (US-based information but inspirational to all). Grow Native Massachusetts – this growing Cambridge-based organization offers many resources for those looking to improve their communities through gardening with natives. Their annual spring plant sale at a historic home in Cambridge is a worthwhile fundraiser with some great deals on native plants. Book: The Green Garden (A New England Guide to Planning, Planting & Maintaining the Eco-friendly Habitat Garden) by Ellen Sousa (Bunker Hill, 2011). Available at bookstores and online. 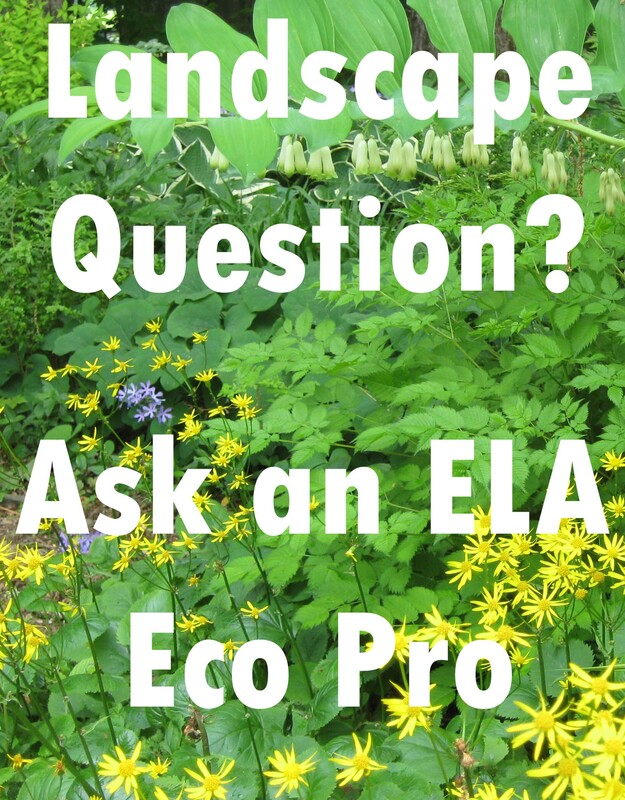 ELA’s LinkedIn discussions offer information about sources for native plants. You have to join, for free, to participate. Ellen Walther Sousa is a garden coach, designer, and author based in central MA. Her 2011 book The Green Garden is an enjoyable guide to improving New England backyards, farms, and forests to support the environment. Ellen lives and breathes plants, farm animals, and wildlife on a small habitat farm in Spencer, MA, called Turkey Hill Brook Farm. You may contact her through her website.